At a young age James was crawling into his mother's kitchen cabinets and to beat on pots and pans. At age six James received his first drum set and started taking lessons from his hometown friend Rick Smith (Rebuilder, The Pomps, & The Toasters). At age 7 he had the opportunity to take lessons from Jeff White (Alma College & Hohner Institute of Percussion) it was here James would learn about jazz history and begin reading music. When his family moved to Cadillac, Michigan he began studying with Marc Alderman (SEEDS, FunDubMentals) focussing on samba music and learn about classical percussion. In 2007 James entered high school and spent the next four years with multiple gigging bands as well state level percussion competitions. He received a school record of nine district one awards for percussion! From the age of 10 onwards all his summers were spent at Blue Lake Fine Arts Camp and ocassionally fitting in a couple weeks at Dayjamz in Ann Arbor, Michigan as well as Dog House Music Camp in Boulder, Colorado. When he was 14 he auditioned for the Blue Lake International Jazz Ensemble and at 15 he was touring Europe with them. At Berklee where James formed the progressive metal band "Aviations" and released their first album "A Declaration of Sound". In May 2014, James signed a six month contract with Carnival Cruiselines. From June 2014 - November 2014 he was cruising around the Bahamas playing drums in "Dat Band"
2015 was a busy year as he became the drummer for local Allston hipster Indie band "Oh Malô", a short lived adventure that saw James playing all over the East Coast! It was also around this time that James began playing with "The Knot's Best of Weddings Hall of Fame" rated band "The Pulse of Boston". James also began releasing original music under the name "With a Smile" an EP entitled "Never Listen" was released in September and a split with Blumen was released in February 2016! The rest of 2016 has been filled with drumming, teaching, and traveling. Summer 2016 James was able to tour with the metal band "Threat Signal" for their 10th Anniversary Under Reprisal Canadian Tour! 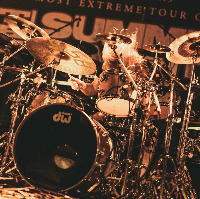 In 2017 James was able to tour with The Faceless as apart of the Summer Slaughter tour and in 2018 did the first Aviations Full US tour with Outrun the Sunlight. James has continued his touring and recording - in 2018 he recorded on over 450 songs for songwriters and bands all over the world!